Driving through Virginia, one can see over 200 different personalized license designs, recognizing everything from sports teams to special interests. Delegate John McGuire, who represents the 56th House District, which includes Louisa and parts of Goochland, Henrico and Spotsylvania counties, has partnered with Louisa County Public Schools to recognize teachers statewide. Del. McGuire had the idea to create a teacher-focused license plate and asked Louisa County Superintendent Doug Straley to assist. Students in Louisa County designed a school bus-yellow license plate that declares “Virginia Loves Teachers.” The Virginia Department of Motor Vehicles recently approved their design. In order for the plate to end up on vehicles, 450 people have to commit to purchasing the plate by January 31. If 450 people do so by the deadline, the plate will go to the General Assembly for approval. 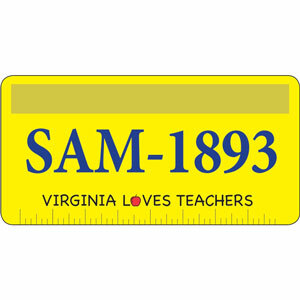 Purchase your rights to a “Virginia Loves Teachers” License Plate. Print your completed form and email the form to woolfoal@lcps.k12.va.us or fax to 540-894-0252. If you have questions about the license plate, please reach out to Del. McGuire’s office at 804-698-1056 or via email at DelJMcGuire@house.virginia.gov. This entry was posted in Community Info / Involvement. Bookmark the permalink.